It was without a doubt an eventful evening. 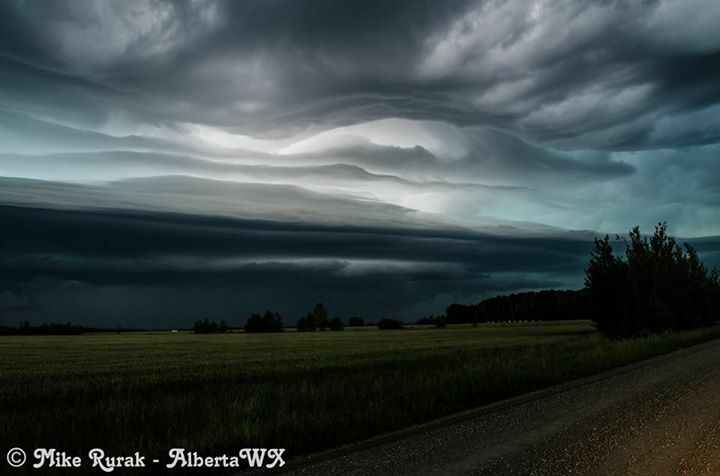 Virtually all our members of the AlbertaWX team (not to mention several other chasers in the vicinity) were stationed near a fast moving squall line as it raced through central parts of the province on Monday. What originally appeared to be a marginally severe setup for us ultimately brought us an impressive show; needless to say, one that certainly made up for the lack of activity we’ve seen this year by far. Photo taken by Chrisy Larualee Hearn. July 20, 2015. Matt Johnson from Prairie Storm Chasers can be seen on the right. What started out as a cluster of strong cells near the Alberta elbow, quickly morphed into a bow echo as it passed east of Edson by 8:00. 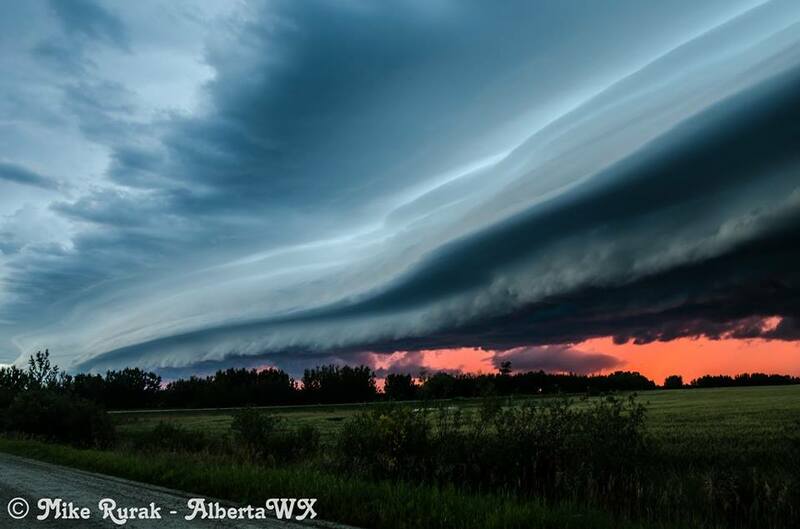 As it neared the Capital Region, the line extended from the Athabasca to Ponoka areas. 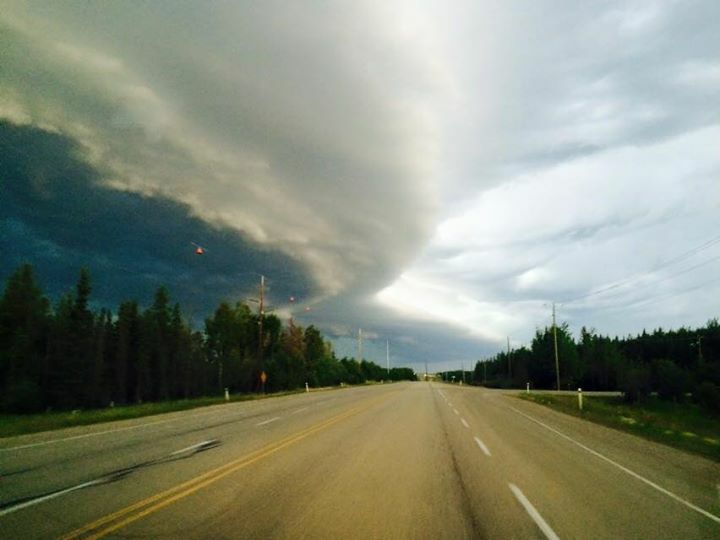 Reports of up to 130 km/h winds were reported as the storm approached Parkland county and hail larger than golfballs were reported near Edson. The radar shot shows the bow echo at its most intense as it neared Drayton Valley. 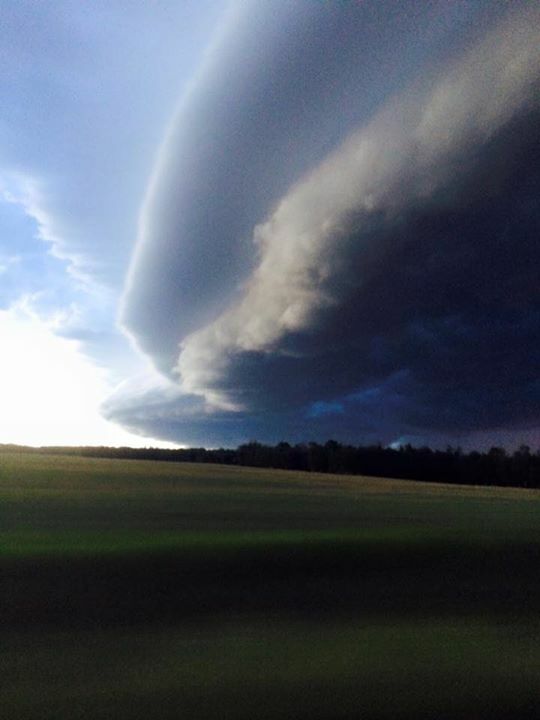 Stationed near Drayton Valley were Cheemo and Chrissy, who watched as the menacing shelf cloud organized. These pictures taken by them basically speak for themselves! Our own take on the severe weather threat. With the threat of the strong winds themselves we went ahead and put out a moderate risk on our Facebook page. We took chances and included Edmonton in the area as well since we agreed that these storms would likely hold for quite a while. Sure enough, a Severe thunderstorm watch was issued for Edmonton by Environment Canada shortly after. Some lowering also became apparent despite the low threat for tornadic activity. Our own Cheemo and Chrisy, were among the few chasers to report lowering. 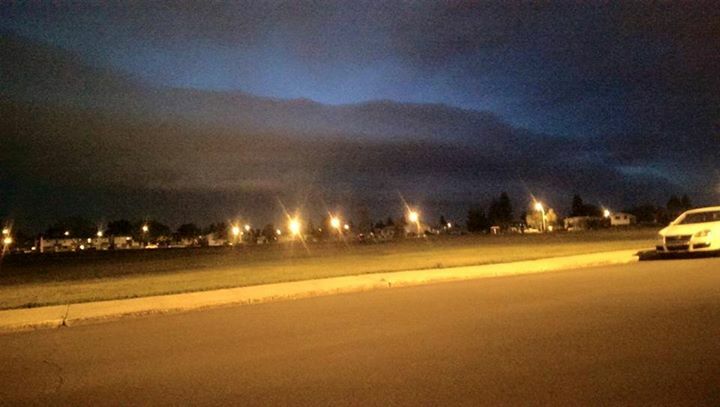 Storm chaser Braydon Morisseau, who was also out nearby caught this. These two shots were taken by Mike Rurak, who was positioned nearby..
Those storms managed to hold as the line of storms approached Edmonton. Caught from home base, the shelf cloud remained visible; indicating that the storm hadn’t lost steam just yet. Severe thunderstorm warnings were issued for the city just after 10:00 PM. It’s worth noting that some areas such as Wabamun had warnings issued well in advance of the storm while it was only just passing over Drayton Valley. It was pretty clear that even EC wasn’t taking chances. AT 10:08 P.M. MDT MONDAY 20 JULY 2015. CO. OF WETASKIWIN NEAR PIGEON LAKE. UPDATED OR ENDED BY 12:08 A.M. MDT. 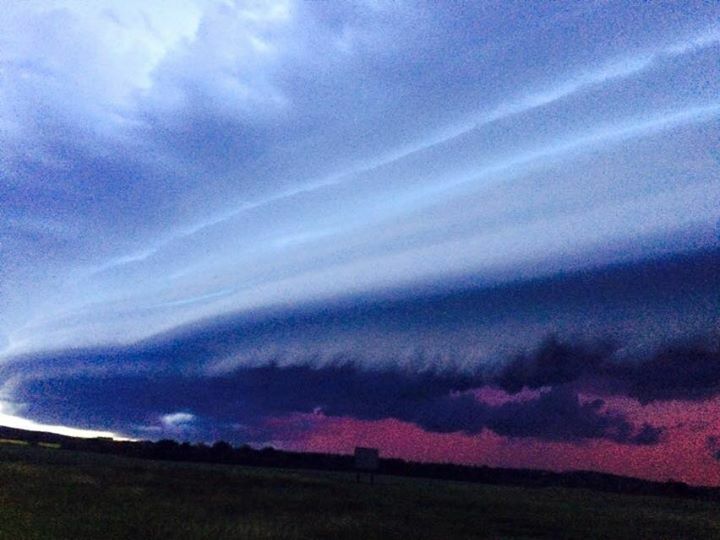 TO REPORT SEVERE WEATHER, PLEASE CALL 1-800-239-0484. SEND AN EMAIL TO STORM(AT)EC.GC.CA OR TWEET REPORTS TO (HASH)ABSTORM. Below are some shots taken by Nick Abra as he watched from the north end . At this point it became increasingly difficult to see as we started to lose daylight. Still nonetheless, plenty of lightning, which could still be seen even as the line was still between Drayton Valley and Entwhistle; over 100 km away! Looked like a pretty good handful of positive strikes as well. From the south side, Mike Walters got some interesting video showing dramatic shift in winds as the storm pushed through (at 2:00).